Industrial Precision 12 in. Flexible Steel Rule with 5R Graduations. Width of rule is 15/32"
This rule is generally of fine quality, the markings are etched and in a nice contrasting black so it's easy to read and the markings are not likely to wear off. It's got graduations in 8ths, 16ths, 32nds and nicely 64ths for those who can see that small. This ruler is indeed very flexible which is handy for measuring curved surfaces. The biggest flaw however, is it did not live up to its claim of being a precision rule. The starting end of the ruler is visibly ground or cut 0.5mm too short rendering measuring from the ends useless! I originally bought 2 of them but both had the same flaw, so it's not a fluke. Pass on this ruler for precision unless you can work around this or can tolerate the lack of quality. Ground edges. Front: Quick-reading 10ths and 100ths." Total B.S. There are no 10th or 100ths markings on this product. I didn't notice until long after my purchase so was not allowed to return this. I am very disappointed in this ruler. Crappy false description. The rule is off on one end so you can't use the entire rule to measure. But I usually start measuring from the 2 inch mark anyway in case I dent the edges of measuring tools. It seems to be pretty accurate apart from that. 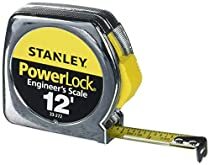 But I wouldn't recommend it if you need the entire 12 inches or for extremely accurate measuring. Other than that I love how thin it is, the different views on the scale and the etched in markings.